We are a Swedish company that invests long-term in essential infrastructure in the Nordic region within energy, transport, telecommunications and social infrastructure. We have SEK 4.45 billion ready to be invested from well-known pension funds and institutions such as KPA Pension, an AP fund, Folksam and EIB. 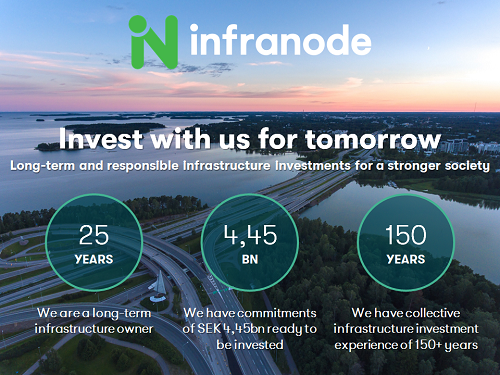 Infranode is a long-term owner and partner to both the private and the public sectors with an investment horizon of 25 years and a focus on stable, predictable returns.